Utah’s Larry Krystkowiak is one of the 10 highest-paid college basketball coaches in America. Is he worth it? 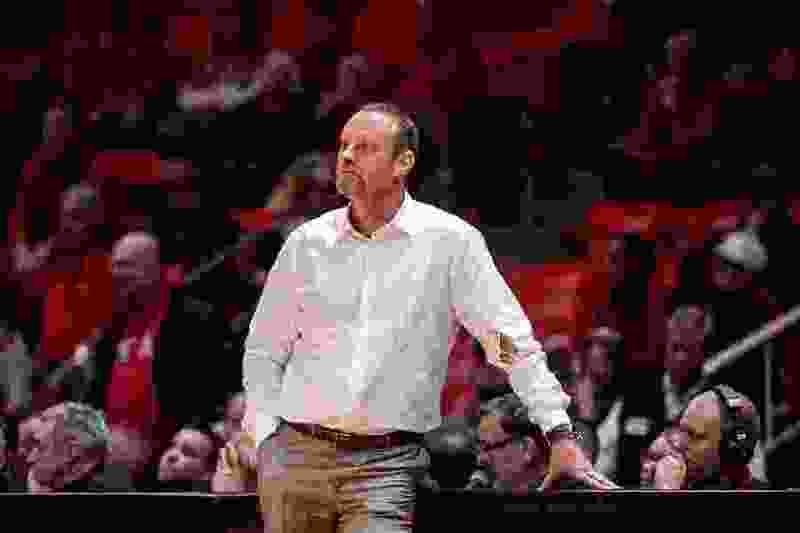 Larry Krystkowiak stood at the scorer’s table as his players warmed up for an early morning practice inside the Huntsman Center, and with one tournament victory already under their belts, he focused them for their matchup with the LSU Tigers. Even a win in Monday’s game, though, will carry an element of disappointment for plenty of Utah basketball fans. The Runnin’ Utes are back in the National Invitational Tournament and, like every Division I college basketball team, they’d rather be playing in a different March tournament. “The goals for our program are, at the end of the season, to be in the hunt for at least an at-large bid [for the NCAA tournament] and then do some damage when we get there,” Utah athletics director Chris Hill said this week. And Krystkowiak is paid handsomely to make sure that happens. The Utah coach is the eighth-highest paid basketball coach in the NCAA, according to USA Today. His salary — $3.39 million per year, thanks to an amendment to his contract that quietly was finalized in November 2016 — makes him the second-highest paid coach in the Pac-12 behind only Arizona’s Sean Miller. Is Krystkowiak worth it? Even after back-to-back years of missing out on March’s madness and settling instead for the NIT, Hill is standing behind his coach and says he believes the best is yet to come. After the Utes reached the Sweet 16 in 2015, Krystkowiak was given a new contract that would pay him at least $2.4 million per season through 2023. The Utes were bounced by Gonzaga from the round of 32 the next year. Still, in November of 2016, Utah quietly boosted Krystkowiak’s salary floor by $600,000 before bonuses and automatic annual raises. Hill declined to discuss the specifics of Krystkowiak’s 2016 deal when asked this week but said it was aimed at keeping the coach at Utah. The raise moved Krystkowiak into the top tier of college basketball coaches. Of the seven coaches who are paid more annually than Krystkowiak, four have won national championships and five have made multiple trips to the Final Four. Ohio State’s Chris Holtmann ($7.1 million) and Arizona’s Miller ($3.6 million) are the only two of the seven without either of those postseason accolades on their resumes. Below Krystkowiak on the list, you can find national champions (Villanova’s Jay Wright makes a reported $2.5 million) and coaches with Final Four appearances (Michigan coach John Beilein’s base salary is about $20,000 less than Krystkowiak’s). Calling himself his own biggest critic, Krystkowiak said being in the top tier of coaching salaries does not change the expectations he has for himself or his program. “Nobody can critique me more than I critique myself,” he said Saturday. “So I’m comfortable in that. I don’t read any of the favorable comments, and I don’t read any of the ones that want me fired. It makes no difference to me. When USA Today released its data for all NCAA basketball coaches earlier this month, the number next to Krystkowiak’s name surprised the Bay Area News Group’s Jon Wilner, a leading expert on the Pac-12. Krystkowiak has yet to win a conference championship at Utah, and his Utes have made just two trips to the NCAA tournament. Still, Wilner said he can understand why Utah would want to keep the coach in Salt Lake City longterm. Success in March is important at Utah, but it isn’t the only measuring stick Hill said he uses for Krystkowiak. Utah’s basketball program was at a low point when Krystkowiak was hired in 2011. “We weren’t rock bottom. We were below rock bottom,” Hill said. Krystkowiak has managed to turn Utah into a solid Pac-12 program, amassing a record of 135-96 in seven seasons. Along the way, he has put three players (Delon Wright, Jakob Poeltl and Kyle Kuzma) into the first round of the NBA draft; attendance has jumped from an average of 8,422 fans per game in 2011 to more than 12,000 per game in 2017; and Krystkowiak’s tenure has seen both the construction of a $36 million basketball facility and renovations of the Huntsman Center. Hill wants to see the Utes back in the NCAA tournament — and soon — and said he believes Krystkowiak has Utah on that trajectory.